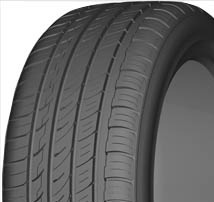 Non-symmetrical pattern ensures excellent grip ability when turning while maintaining the uniformity of tread wear. Special-designed tire shoulder blocks provide high-speed cornering stability. Full covered with small non-slip grooves in the tread,this pattern ensures the driving stability under various environments and improves the accelerating and braking performance.